Revive a love for fresh, made from scratch cooking through these fantastic mortar and pestles. 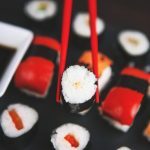 Getting involved in the food preparation process can work wonders in making cooking fun again, and let you add that personal touch to every dish. Knowing that you’re using the same tools that have been used for thousands of years is a priceless way to add real authenticity to your cooking, all from mashing up some ingredients with a stick. Not bad! Through our research, we’ve brought together the best mortar and pestles on the market today. With a variety of shapes, sizes, and materials, we’re sure there’ll be one here for you. Not sure what you’re looking for? Don’t worry. Check out our ‘Buyer’s Guide’ below, which covers the most important aspects to look out for. By understanding what suits you, it’s much easier to figure out which one of these will belong in your home. 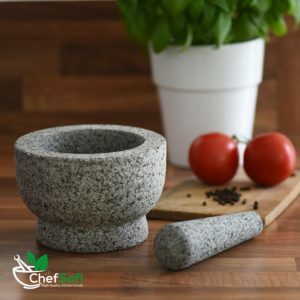 If you’re just looking for one recommendation – just one – then we would recommend ChefSofi’s granite mortar and pestle set. It satisfied everything you could want in a good mortar and pestle. Both the mortar and pestle are fairly heavy, making grinding easy – especially with the wide pestle. The interior of the bowl is nice and rough, without being so coarse you’ll lose small parts of what you’re grinding to the granite pores. 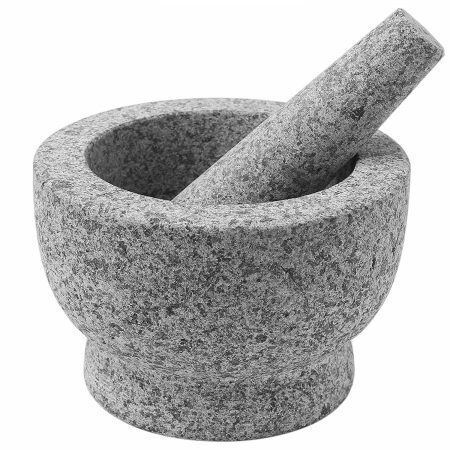 Our top pick – ChefSofi’s granite mortar and pestle. ChefSofi have also proven themselves to care for their customers, and provide a free anti-scratch and anti-slip when you buy the set. Which is great to make your job easier, while protecting your counter at the same time. 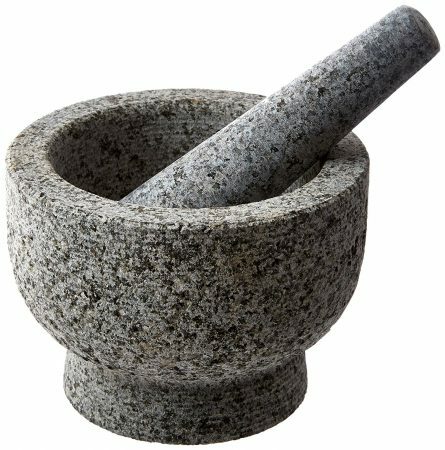 So while it’s a fairly basic looking mortar and pestle, we think it’s the best in overall quality and value for money. If you’re interested in more ‘luxurious’ materials like marble, steel, and wood – then check out our list below to find some more unique variations. What makes a good Mortar & Pestle? When it comes to buying a mortar and pestle, there’s more to it than shopping for the latest shiny new gadget. These ancient tools are still irreplaceable in terms of their authenticity and ability to let you get really hands on with your ingredients. And it’s being able to take your time and appreciate your ingredients like this that really brings cooking back to it’s roots. Weight – the heavier the mortar is, the less effort you’ll need to grind the ingredients down. Roughness – a great mortar holds the perfect balance between rough and smooth. 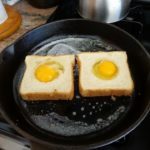 Rough enough to grind down ingredients, but also smooth enough to keep them from getting trapped in the sides. Shape – often overlooked, you generally want a tall and narrow mortar. This keeps all the ingredients falling back to the centre, and prevents you from having to ‘chase’ your spices around the bowl. Size – with a range of sizes available, think about what you’ll use the mortar for. If it’s just to grind the odd extra spice, then a small mortar will do the trick. But go bigger if you’ll be looking to combine multiple ingredients and/or use the mortar to crush larger ingredients to make dips, like avocados. Pestle – a good pestle is long enough to protect your knuckles from hitting the bowl, and heavy enough to make grinding spices easy for you. The most influential factor in any mortar is it’s material. First up, we wouldn’t recommend porcelain or clay types – they’re just too light and fragile. The overall best material type is typically stone or marble. Heavy and coarse, these mortars are ideal for easily grinding down spices. Just make sure the material is also smooth enough to allow the spices to run down the edges. While normal stone is typically much rougher, marble is much smoother but not as coarse. A great alternative is wooden mortars – which are lighter and can’t be used for really hard ingredients like peppercorns or nuts. However, their fantastic, almost tribal, looks are unmistakable. So while their uses are limited, they do make a great addition to any kitchen. Our top pick, a fantastic granite set that is ideal for cooking. This ChefSofi set is about all you can ask for in a mortar and pestle. Made from heavy granite, it’s got that great balance between being rough enough grinding while remaining smooth enough to use easily. The sides are tall and narrow, letting the ingredients easily slide back to the centre of the mortar, while the pestle is a well-sized and heavy enough to make any type of grinding smooth and easy. The bowl is nice and large, adding to the useful weight but also providing plenty of grinding space. Holding up to two cups of material without losing it’s efficient narrowness, the bowl is a cinch to use – no matter the grinding material. When you purchase this set, ChefSofi also throw in an anti-scratch, anti-slip pad. This works well to let you use the mortar on any surface without worrying about damaging it, while also helping you by holding the bowl still during grinding. 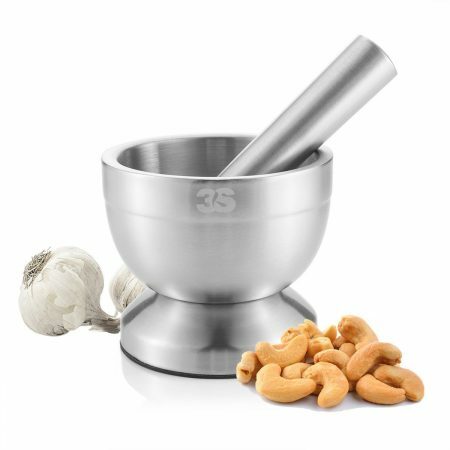 If you’re simply looking for a solid, reliable, long-lasting and well-built mortar and pestle – then this is the one. It ticks every box we have been looking for from these kinds of products. A great example of quality all around with no particular drawbacks. Heavy, well-shaped, excellent surface finish, and a pad included to protect your countertop as well as making grinding easier. We can’t ask for much more than that. It is one of the pricier sets, but we believe in paying for quality when it comes to purchases like this. A good mortar and pestle will easily last a lifetime. We think paying a bit extra to make sure a tool you’ll likely be using for decades is built to a quality which is always enjoyable to use. Combining modern materials with ancient tools. Combining modern technology with this ancient tool, these stainless steel mortar and pestles are a great mash-up of the two. 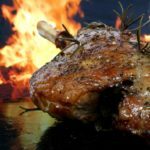 While they’re not exactly traditional, using steel does mean that the price stays low, without sacrificing on the durability. Caption: Dropping a steel mortar is unlikely to damage either the bowl or the floor. The same can’t be said for a heavy stone version! However, the inside of the bowl is very smooth. 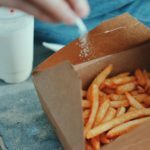 This means that it’s not recommended if you want to grind down traditional herbs and spices. However, it’s still great for rougher grinds which don’t need to be so fine. It could be especially useful as a cheap pill grinder. There’s also, if you look closely, a small rubber ring on the bottom of the bowl. 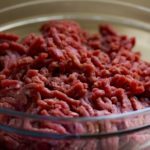 This really helps to keep the bowl steady as you mash away, making it much easier on your forearms, and on your kitchen counter. For us, products like a mortar and pestle set are all about the authenticity. Appreciating the history and culture behind it, including it almost as much as an ornament as a kitchen tool. However, that doesn’t mean a steel version doesn’t have it’s uses. Far from it. With a great price, easy to clean surface, and light weight, this steel mortar and pestle can be very useful for anyone who needs functionality. Great for light grinding or pill crushing, this set can be a very cheap but useful addition to your kitchen repertoire. Smooth, great looking marble - with a roughened interior for efficient grinding. The one issue that marble mortar bowls usually have is that they’re just too smooth. However, Greenco have left their version purposefully rougher on the interior, meaning that you don’t lose out on so much grinding power. Marble bowls are typically a bit more of a ‘luxury’ than basic stone models. You really can’t beat the look of the perfectly shaped marble bowl, which for many people will more than make up for the slight loss of grinding power compared to a stone model. Greenco offer this marble bowl for a great price, and it’s available in two sizes – 3.75″ and 4.5″. 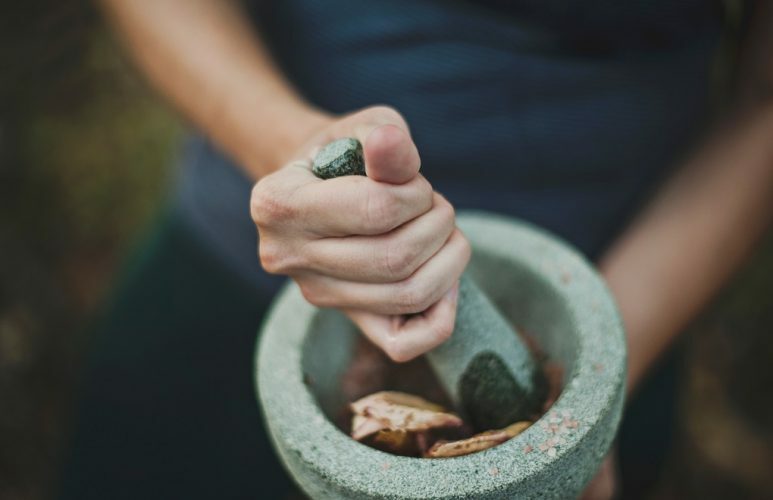 It’s not the most heavy duty mortar and pestle out there, but it does the job well – and looks fantastic while doing it. Or not doing it. It pretty much just looks fantastic everywhere. There’s a lot to be said about a mortar and pestle being as much about the looks as it is about the functionality. After all, this isn’t a speedy new modern gadget. This marble version is perfect for anyone who’s got an eye for design as well as a taste for delicious homemade seasonings. The bright color stands out well, and the exterior is that type of smooth you only get with marble. Provided you’re not looking to fill out a spice rack full of weird and wonderful concoctions, this mortar and pestle set will be well suited to most uses, as well as looking great. Acacia wood used for the fantastic flowing patterns that it displays. If you want the irreplaceable authenticity of a wooden mortar and pestle set, there are plenty of options out there. Unfortunately, most of them are really bad. Too cheap, too skinny, and very awkward to work with. They look traditional, but that’s about all they’ve got going for them. This acacia wood model from Ironwood is different, though. Very different. First, this isn’t just cheap wood – acacia is used for the amazing patterns that flow through it. It’s also got a great weight to it in your hand, and this mortar bowl has been shaped wonderfully. It’s so easy to hold, giving you a great grip. The wide base of the pestle is also perfect. It means you’re not ‘chasing’ the ingredients around the bowl. So while the mortar and pestle aren’t pure grinding heavyweights, they still do much more than just look pretty. This mortar and pestle set is a perfect balance between looks, authenticity, and functionality. It’s like a quaint wooden ornament that also has a real use to it. We can’t recommend it if you’re looking for a pure grinder like a heavy stone model, but otherwise it is fantastic. More than capable of allowing you to easily crush up things likes nuts and seeds, and the bowl just fits so naturally into the hand. 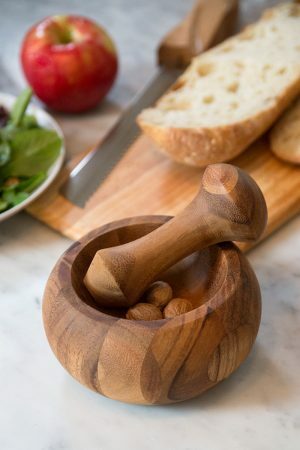 If you’re looking for a mortar and pestle out of appreciation of the history, as much as actually just wanting to use one, we can’t recommend this acacia version enough. We love it. From one famous British chef to you, a fantastic home chef! Coming from the famous British chef Jamie Oliver, this mortar and pestle is (as you would expect) – perfectly geared towards cooking use. It’s stone. It’s big, it’s quite bulky. The pestle has a good weight and is nice and wide. The bowl is a good size, with narrow sides and a good balance of well-rounded roughness on the interior, which is great for grinding. This set also comes with two options – polished or unpolished. Don’t worry, this is just referring to the exterior. So you can have it smooth up against your hands, or keep that natural courseness. It’s a personal choice. The only reason that this isn’t our top choice, since it ticks every box, is due to other customers’ experience. 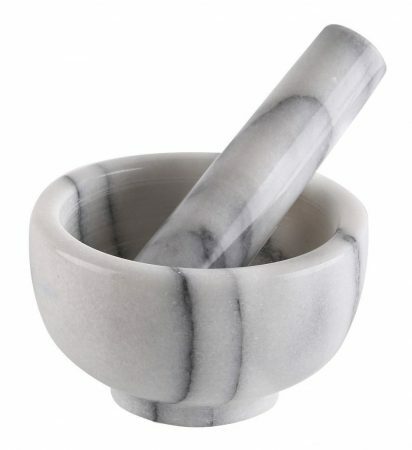 There’s a few reviews complaining of receiving a broken bowl or pestle, versus nothing of the sort with the ChefSofi. So while this product is just as good as our top choice, it’s just dropped a point for risk of breakage in delivery. This is definitely a mortar and pestle geared towards getting real use in the kitchen. You can really tell it’s produced under the name of a chef. The heavy and coarse bowl are just what you want in a mortar, and the weighted pestle makes grinding almost effortless. A few stories we’ve heard of breakage in delivery means it hasn’t made our top spot, but the product itself is faultless from our point of view. Heavyset mortar and pestle Heaviness is great for grinding, just be careful not to drop it! We hope you’ve found your perfect mortar and pestle set with us, using this list. If not, don’t worry. 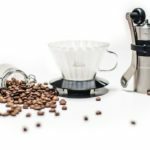 We recommend checking out Amazon’s bestseller list of mortar and pestles for more inspirations. While we do like to only shortlist the best products, there’s plenty of other good ones out there. At the end of the day, we hope you do get yourself one of these sets – regardless of where you find the one for you. They’re such great tools to have in the kitchen, and are perfect when you get that urge to prepare a fantastic, made-from-scratch meal. Sometimes, there’s nothing more stress relieving than taking your time in the kitchen, and beating the living daylights out of some herbs and spices with your caveman stick.